Report on the first Seven % Solution Tasting, on Saturday May 11th, 2013, at Bergamot Alley Bar & Wine Merchants in Healdsburg. The event showcased wines made from California’s less widely-planted grape varieties. The tasting was organized by a group of 17 wineries along with Kevin Wardell and his wife Sarah Johnson, the proprietors of Bergamot Alley. According to the information provided by the event organizers, just eight grape varieties comprise about 93% of winegrape acreage planted in Northern California – the idea of this tasting was to highlight the other 7%, many of them lesser-known varieties. Sam Bilbro of Idlewild Wines told me that he had mentioned the concept to Duncan Meyers and Nathan Roberts of Arnot-Roberts, and that they then pitched the idea to Kevin and Sarah, who were excited about hosting the tasting. Following some initial planning meetings, they invited a group of vintners they knew and whose wines they enjoyed, and the event came together quickly from there. 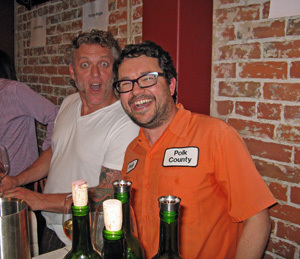 There was a media/trade tasting on Wednesday May 8th as well as the Saturday public tasting. I was unable to make it on Wednesday, so my notes are entirely from the public tasting. Everyone seemed pleased with how the event turned out, and it’s likely that there will be future Seven % Solution tastings. Because of the popularity of the event, it may be moved to a larger venue to accommodate more wineries and more tasters. There were 17 producers pouring their wines at the inaugural Seven % Solution tasting. All of the participating wineries were from Northern California – all based in the North Bay and East Bay, in fact – though some wines were sourced from fruit grown in other parts of the state. 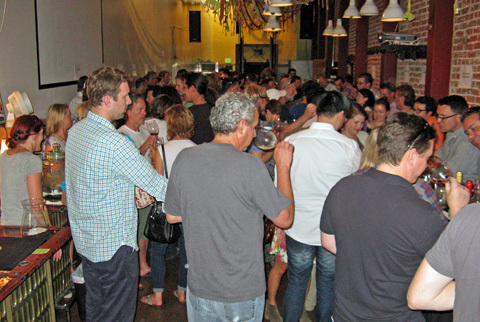 The Bergamot Alley space is not too large, so 17 winery tables was all it could handle, and public tickets were limited so as not to overcrowd the space. Obviously if there had been room for more wineries at the event, we may have seen some producers from other parts of Northern California – Lodi, Clarksburg, Monterey, Mendocino, Santa Cruz Mountains, Sierra Foothills, etc. Hopefully future tastings will include wineries from a wider geographical area, perhaps extending to Paso Robles and Santa Barbara as well. The tasting was arranged with winery tables set up on each side of the long, narrow space. Even with the limited public ticket sales, the room was packed, and with the already hot weather in Healdsburg that afternoon, it made things uncomfortably warm at times. Still the event was well-organized and ran smoothly. I want to make special mention of the handy tasting booklet, designed by Sarah Johnson of Bergamot Alley. It included all the key information that a taster would want to know, including winery names, websites, email addresses and phone numbers, plus a list of wines each producer was pouring – though as is the case at any tasting, some wineries poured additional wines. The booklet even included a clever small envelope to hold business cards. But best of all, the booklet was compact – about 4½ by 5½ inches – small enough to easily carry around to jot down notes or just to slip into a pocket, unlike the large and unwieldy tasting booklets I see at some other events. Since I had arrived at Bergamot Alley on the late side – I’d come from another tasting earlier in the afternoon – I tried to save a bit of time by passing on a handful of wines, particularly among the first few producers I visited. In the end, I managed to taste at all of the winery tables except The Scholium Project – their table was packed when I first went by, and when I came back near the end of the event, they had just poured out of their wines. You’d think I would know better than to pass by the table of a popular winery by now! These producers deserve credit for being willing to take chances on lesser-known grape varieties that don’t bring in as much money as Cabernet and the like. They also deserve credit for seeking out the often-tiny plantings of these grapes, finding older vineyards with varieties once more-widely planted in the state but now seen much less often, as well as for convincing growers to take a risk with new plantings of obscure grapes. Some of the varieties are so unusual in California that for a few of them, a single vineyard was the grape source for most of the wines made from that variety at the tasting – for example Trousseau Gris from Fanucchi Wood Road Vineyard and Ribolla Gialla from Vare Vineyard. But thanks in large part to the producers at this event and to others as well, the increased interest in wines from offbeat grapes means that we’ll see more plantings of them coming online soon. Some of the grape varieties showcased at this tasting are truly rare in California (Ribolla Gialla, St. Laurent, Gamay Noir, Blaufrankisch), while others are in fact planted on a significantly wider scale (Pinot Gris, Barbera, Grenache) and show up in lots of fine wines up and down the state. And though Rhône grape varieties may fall within the 7% acreage theme of the event, many of them seem downright commonplace in California these days, some 25-30 years after the “Rhône Rangers” movement first blossomed. 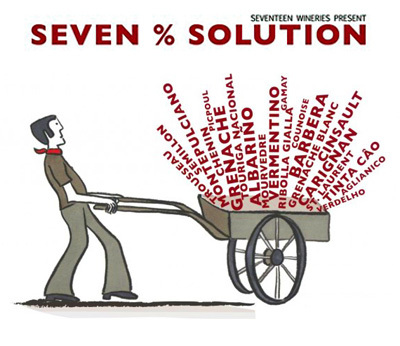 The wineries participating in the Seven % Solution tasting share a desire to do something different, and that was clear not only in the choice of grape varieties but in the non-mainstream winemaking techniques that many of them employ. In fact, one could argue that in some cases this tasting showcased those techniques as much as or more than the grape varieties themselves. Skin-fermented whites, whole-cluster fermented reds, carbonic maceration, lengthy extended maceration, use of concrete tanks, etc. – all were on display. And while many of the producers at this tasting shied away entirely from newer oak in their wines, a few others demonstrated that a percentage of new oak can work very well with some of these varieties if it is handled appropriately to keep it in balance. One thing to note about the grape varieties highlighted at this tasting is that there is a reason why few of them are widely-considered to be “noble” or “classic” varieties. Although the wines can be very interesting and enjoyable, it’s unlikely that most of these grapes are capable of producing wines with the type of depth, complexity, and aging potential of great Pinot Noir, Chardonnay, or Cabernet Sauvignon, for example. But that’s not to say that there is not a significant place for these “7%” wines. Many of them can be tremendously versatile and food-friendly. Most producers of these lesser-known varieties in California seem to realize this, seeking to make wines that are distinctive and fun, yet of high quality – and for the most part keeping prices reasonable as well. The Seven % Solution tasting featured lots of very good wines, not surprising given the stature of many of the participating wineries. There were more whites and Rosés poured than reds, and my list of Favorites is skewed even more heavily in that direction. In general, I found the whites at this tasting to be more distinctive wines than the reds. Part of the reason for this was that there were not that many truly unusual red varieties on display in comparison to the whites. Wineries poured many 2012 wines, even a few reds. Though many of them were very tasty now, I thought some would be better given at least a few more months in bottle to settle down. But by and large, the wines at the Seven % Solution tasting are meant to be consumed in the short term – they’re wines to be enjoyed rather than collected. Overall, the good news is that most of the wines poured at this event were intriguing and refreshingly different, and I found something to like from every producer. The better news is that these wineries represent only the tip of the iceberg of California producers working with lesser-known grape varieties – in many ways, these are the “7% of the 7%.” So there are many more wineries to check out for those looking to explore some of the more offbeat varieties made in California. I greatly enjoyed the Seven % Solution tasting at Bergamot Alley. I did think the name of the event was a curious choice – as fans of mystery fiction may know, “Seven Percent Solution” refers to the cocaine that detective Sherlock Holmes was supposed to have regularly injected. Will we become hooked on these wines made from lesser-known California grape varieties? Based on the wines I tasted at this event, I’d say the answer is elementary – it’s a distinct possibility! Arnot-Roberts 2011 Old Vine White, Compagni Portis Vineyard, Sonoma Valley. Field blend of Sylvaner, Riesling, Gewürztraminer, Green Hungarian, Berger, and French Colombard, fermented in stainless steel and aged in neutral oak. Light straw color, this displayed green apple, citrus, a bit of spice, and a slightly nutty note on the nose. Medium-light bodied, this had a lively mouthfeel and finish. Arnot-Roberts 2011 Ribolla Gialla, Vare Vineyard, Napa Valley. Six hours of pre-press skin contact, fermented in stainless steel and aged in neutral oak with no lees-stirring. Light color, with lightly floral citrus, earth, and herb aromas along with a saline component. Slightly more weight and texture in the mouth than the previous wine, with a long, tasty finish, nice. Arnot-Roberts 2011 Trousseau, Luchsinger Vineyard, Clear Lake. 100% whole-cluster fermentation, aged in a foudre and four puncheons. Light salmon color, featuring lightly floral red fruit and stone fruit aromas, plus herbal and slightly peppery notes. Lighter-bodied with good acidity and a clean finish. Comments: The winery was founded by Duncan Arnot Meyers and Nathan Roberts in 2002. The dry-farmed Compagni-Portis Vineyard was planted in 1954. Duncan poured the Arnot-Roberts wine at the tasting – they also had a Rosé made from Touriga Nacional and Tinta Cão that I didn’t taste. Bedrock 2012 Rosé, “Ode to Lulu,” California. Whole-cluster pressed from Mourvèdre and Carignane. Very light pink/salmon color, with fresh strawberry, spice, and a hint of flowers. More weight on the palate than many Rosés but with refreshing acidity and a tasty finish, nice. Bedrock 2012 Albariño, “Abrente,” Napa Valley. Very light color, this showed stone fruit and herb notes on the nose. Lighter-bodied with good acidity and a clean finish. Comments: Bedrock owner/winemaker Morgan Twain-Peterson is the son of Ravenswood winery founder Joel Peterson. Morgan has been among the forefront in bringing attention to the preservation of old vines in California. Bedrock also poured a white from Compagni Portis Vineyard that I didn’t taste. The Albariño made with Michael Havens, who made one of California’s first Albariños at Havens Wine Cellars. Broc 2012 Picpoul, Luna Matta Vineyard, Paso Robles. Fermented in a concrete egg. Very light straw color, displaying bright lemon and grapefruit plus a touch of fresh herbs. Zingy acidity combined with a mildly chalky texture, nice. Broc 2012 Rosé, Santa Ynez Valley. From 50% each Counoise and Cinsault. Very light pink color, showing red fruits, earth, and a slightly savory note. Lighter-bodied with a lively mouthfeel and fairly smooth finish. Dirty and Rowdy 2012 Sémillon, Yountville, Napa Valley. 80% fermented on the skins and aged in neutral oak, 20% fermented and aged in a concrete egg. Light color, this featured stone fruit, herbs, and a slightly saline character. Moderately rich with a lively texture and a mild tannic bite on the finish, distinctive and nice. Dirty and Rowdy 2012 Mourvèdre, Santa Barbara Highlands. 100% whole-cluster fermented, aged in neutral oak. Medium-light purple, fairly fruit-forward plum and raspberry aromas along with a notable stemmy/herbal component and milder notes of earth and spice. Medium bodied with good acidity and a moderately tannic finish. Needs some time in bottle for everything to come together. Comments: Launched in 2012, Dirty and Rowdy is the project of Hardy Wallace and Matt Richardson with their wives Kate and Amy. Hardy, who also writes the Dirty South Wine blog, was behind the table at the tasting. The winery also makes a Mourvèdre from Shake Ridge Ranch in Amador County. Forlorn Hope 2012 Trousseau Gris, “Trou Grit,” Suisun Valley. Fermented on the skins. Pale salmon color, this showed pretty floral notes along with spice, fresh herbs, and ripe red fruits. Medium-light weight with a touch of tannic grip on the finish, nice. Forlorn Hope 2012 St. Laurent, “Ost-Intrigen,” Carneros. Medium-dark color, featuring earthy and very savory aromas, plus dark berry fruit. Medium-bodied and lively, this finished with fairly mild tannins, nice. Comments: I’ve been following Matthew Rorick’s intriguing Forlorn Hope wines for several years. The wines are made in the Fairfield area, and only older barrels are used for aging. I skipped the “Que Saudade” Verdelho on this occasion since I expect to taste it at another event coming up soon. I thought that both Forlorn Hope wines I tasted were standouts. Idlewild 2012 Arneis, Fox Hill Vineyard, Mendocino. Whole-cluster pressed and aged in 50% stainless steel and 50% neutral oak. Light straw color, this displayed bright stone fruit aromas with slight floral and herbal undertones. Medium-bodied with good texture on the palate and a long finish, nice. Idlewild 2012 Grenache Gris, Gibson Ranch, Mendocino. Partial carbonic maceration and partial skin fermentation, aged in stainless steel and neutral oak. Very light salmon color, with shy red fruit and spice on the nose. Medium-light weight with a smooth mouthfeel and finish. Comments: Sam Bilbro and his wife Jessica are the proprietors of Idlewild. Sam grew up surrounded by grapevines and wine – his father Chris founded Marietta Cellars in 1979. Gibson Ranch is part of McDowell Valley Vineyards, and the dry-farmed Grenache Gris vines are over a century old. Jolie-Laide 2012 Pinot Gris, Windsor Oaks Vineyard, Chalk Hill. Whole-cluster pressed and aged mostly in stainless steel with some neutral oak. Light color, showing upfront stone fruit aromas with hints of flowers and earth. Medium-light bodied and lively with a fresh finish. Jolie-Laide 2012 Trousseau Gris, Fanucchi Wood Road Vineyard, Russian River Valley. Destemmed and partly fermented on the skins for five days, aged in neutral puncheons. Light pink tinge, this featured stone fruit plus hints of strawberry, dried herbs, and a touch of spice. Medium weight on the palate with a long finish, nice. Comments: Scott Schultz of Jolie-Laide has worked with Pax Mahle at Wind Gap. The winery name is a French term translating literally to “pretty-ugly” but meaning unconventionally beautiful. Duncan Meyers had told me to make sure I didn’t miss the Jolie-Laide Trousseau Gris and that was good advice. Leo Steen 2006 Chenin Blanc, Saini Farms, Dry Creek Valley. Light straw color, with slightly nutty oxidized aromas along with stone fruit and dried herbs. Moderately rich mouthfeel with a long finish, quite a nice Chenin Blanc with some age on it. Leo Steen 2011 “Calpella,” Red Table Wine, Mendocino. Field blend of 84% Carignan and 16% Petite Sirah, fermented with 25% whole clusters, aged in 25% new oak. Medium purple color, with earthy plum and raspberry fruit plus touches of pepper and spice. Medium-bodied with a fairly smooth mouthfeel and moderately tannic finish. 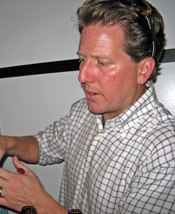 Comments: Owner/winemaker Leo Hansen launched the Leo Steen label in 2004. The Chenin Blanc from Saini Vineyard came from vines planted about 1980. The 2006 Chenin Blanc poured at the tasting showed the aging potential of this wine. The older vines at organically-farmed Testa Vineyard are relatively well-known, and these provided the fruit for the “Calpella” blend. Massican 2012 White Wine, “Annia,” Napa Valley. 46% Ribolla Gialla, 36% Tocai Friulano, 18% Chardonnay, sourced from four vineyards. Very light straw color, this displayed citrus and floral aromas plus touches of earth and fresh herbs. Medium weight in the mouth, this had a long and lively finish, nice. Comments: Dan Petroski of Massican is also the winemaker at Larkmead in Napa Valley. 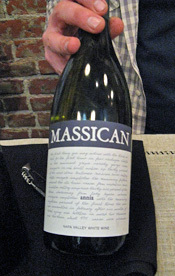 The first Massican vintage was in 2009 and the winery also produces Sauvignon Blanc and Chardonnay in addition to its Friuli-inspired “Annia.” The 2012 “Annia” blend differs from the 2011, which was more Tocai-based. Tendu 2012 White Wine, California. 78% Vermentino, with 17% Cortese and 5% Arneis that were co-fermented. Made in neutral oak with no malolactic fermentation. Very light color, with earthy and herbal stone fruit aromas. Bright and fresh mouthfeel with a clean and tasty finish, nice. Matthiasson 2011 White Wine, California. 56% Sauvignon Blanc, 20% Ribolla Gialla, 18% Semillon, 8% Tocai Friulano. Light color with notes of herbs, citrus, white peach, and a nutty element. Moderately rich on the palate with a long, smooth finish. Comments: Steve Matthiasson is a noted viticulturist in addition to making wine. He also makes a very fine Rosé that was not poured at the tasting. Matthew Plympton of wine broker Revel Wine was pouring the wines when I stopped at the table – Revel and Matthiasson partnered to produce the Tendu wine, which comes in a one-liter crown-capped bottle. The Vermentino comes from the Dunnigan Hills area in Yolo County while the Cortese and Arneis are sourced from Fox Hill Vineyard near Ukiah. RPM 2011 Gamay Noir, El Dorado County. Sourced from Witters and Barsotti Vineyards near Placerville. Medium color, this featured bright plum and earth aromas plus herbs and hints of wet stone. Medium-bodied and lively, finishing with moderately grippy tannins, nice. Ryme 2012 Vermentino, “Hers,” Las Brisas Vineyard, Carneros. Whole-cluster pressed and aged in stainless steel and neutral oak. Very light color with slight green tinge, with white peach and pear aromas along with fresh herbs and a slight saline quality. Vibrant mouthfeel with a long, clean finish, nice. Ryme 2011 Vermentino, “His,” Las Brisas Vineyard, Carneros. Whole-cluster fermented for about two weeks and aged in neutral oak. Light color, with stone fruit, spice, earth, and nutty aromas. Bigger texture than the “Hers” bottling, with a medium-light tannins on the finish. Ryme 2010 Ribolla Gialla, Vare Vineyard, Napa Valley. Destemmed and fermented on the skins for about one month, barrel-aged for two years. Medium-light gold color, displaying citrus rind, hints of flowers and nuts, herbs, earth, and pepper. Moderately rich on the palate with a smooth mouthfeel and some grip on the finish, very distinctive wine. Ryme 2010 Aglianico, Luna Matta Vineyard, Paso Robles. Whole-cluster fermented and aged for 18 months in barrel. Dark color, showing intense plummy, smoky, and very spicy aromas. Medium-full bodied with a very grippy tannic finish. 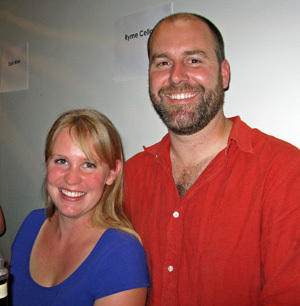 Comments: Ryme Cellars was founded in 2007 by Ryan and Megan Glaab – the first two letters of their first names form the winery name. Both were on hand to pour their wines. They also make Chardonnay and Pinot under the Verse label. The “His” and “Hers” versions of Vermentino, sourced from Francis Mahoney’s Las Brisas Vineyard, were a fascinating contrast. Stark 2011 Grenache Blanc, Saarloos Vineyard, Santa Ynez Valley. Fermented in stainless steel, no malolactic fermentation. Very light color, this featured ripe stone fruit and pear plus mild herbal notes. Medium-light weight with a fairly smooth texture and finish. Stark 2011 Viognier, Damiano Vineyard, Sierra Foothills. Made in 50% each stainless steel and neutral oak. Light yellow/straw color, with ripe, almost candied fruit aromas long with earth and lees. Medium-bodied with a long finish. Stark 2011 “Cuvée Ivy,” Mendocino County. Mostly Grenache, plus Syrah, Carignane, and Counoise, sourced from Eaglepoint Ranch. Medium purple color, bright strawberry and raspberry fruit along with touches of flowers, dried herbs, spice, and earth. Lively mouthfeel and medium tannins, nice. Stark 2012 Counoise, Eaglepoint Ranch, Mendocino County (barrel sample). Medium-dark purple, showing darker fruit aromas plus floral and spice notes. Medium-bodied with moderate tannins. Comments: The fruit for winemaker Christian Stark’s wines came from a broad area. Damiano Vineyard is located near Auburn, farther north than most Sierra Foothills vineyard sources. I particularly liked the “Cuvée Ivy” blend, with fruit from Eaglepoint Ranch in the hills east of Ukiah. Two Shepherds 2011 Grenache Blanc, Saarloos Vineyard, Santa Ynez Valley. Fermented and aged on the lees in neutral oak. Very light color, this featured apple and pear aromas, plus lees and spice. Medium-light weight with a fairly smooth mouthfeel and finish. Two Shepherds 2011 “Pastoral Blanc,” Saralee’s Vineyard, Russian River Valley.40% Roussanne, 20% Marsanne, 20% Viognier, 10% Grenache Blanc, fermented and aged on the lees in neutral oak. Light yellow/straw color, with lots of spice along with stone fruit and hints of tropical fruit on the nose. Medium-bodied with a richer mouthfeel and finish than the Grenache Blanc. Two Shepherds 2011 “Centime,” Saralee’s Vineyard, Russian River Valley.50% eachMarsanne and Roussanne, co-fermented on the skins for ten days and aged in stainless steel. Light color with a slight orange tinge. Somewhat higher-toned aromas of apple and stone fruit, plus earth and plenty of spice. Medium-bodied, this had a fairly rich and slightly tangy finish. Two Shepherds 2011 Grenache, Saralee’s Vineyard, Russian River Valley.100% Grenache, aged in neutral oak. Medium-light color, displaying savory aromas upfront along with cherry and strawberry fruit, and a hint of peppery spice. Lively mouthfeel with moderate tannins and a flavorful finish, nice. Two Shepherds 2011 “Pastoral Rouge,” Sonoma County / El Dorado County.40% Grenache and 40% Mourvèdre from Saralee’s Vineyard and 20% Syrah from El Dorado. Medium-light color, with an earthier character plus plum and darker berry fruit. Bolder mouthfeel with fairly grippy tannins. Two Shepherds 2011 Syrah, Saralee’s Vineyard, Russian River Valley.Some whole cluster fermentation, aged in neutral oak and some Viognier lees and skins. Medium-dark purple, featuring lightly floral notes along with black fruits, earth, and lots of spice. Medium weight on the palate with youthful tannins. This needs time but should develop nicely. Two Shepherds 2012 Mourvèdre, Windsor Oaks Vineyard, Russian River Valley (barrel sample).100% Mourvèdre. Medium-light color, this had plum and black cherry on the nose along with touches of dried herbs and earth. Lively mouthfeel with chewy tannins on the finish. 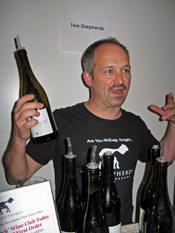 Comments: Two Shepherds owner/winemaker William Allen poured his wines at the event. He also has a wine blog called Simple Hedonisms. The “Pastoral Rouge” and Syrah were pre-release peeks. William told me that he expects to be able to continue sourcing fruit from Saralee’s Vineyard – it was sold recently to Jackson Family Wines. Unti 2012 “Cuvée Blanc,” Estate, Dry Creek Valley. 46% Vermentino, 43% Grenache Blanc, 11% Picpoul, made in stainless steel and concrete. Light straw color, with citrus and pear, earth, lees, and spice. Medium-light bodied with a lively texture and finish, nice. Unti 2012 Rosé, Estate, Dry Creek Valley. From 83% Grenache, 17% Mourvèdre, destemmed and pressed, no saignée. Light salmon color, this displayed bright strawberry aromas along with touches of herbs a hint of black pepper. Medium-light mouthfeel, with a little tannic bite on the finish. 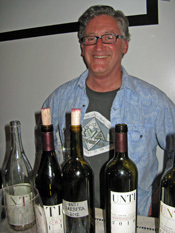 Unti 2011 Grenache, Estate, Dry Creek Valley. 77% Grenache, 23% Syrah. Medium-light ruby color, this showed lots of upfront spice, plus red fruits, fresh herbs, and earth. Medium-bodied with a vibrant mouthfeel and long, clean finish, nice. Unti 2012 Barbera, Estate, Dry Creek Valley (barrel sample). Aged in a variety of vessels – barrique, foudre, and concrete. Medium-dark purple, featuring cherry, earth, and spice on the nose. Slightly richer mouthfeel than the previous wine, with good acidity and a long, moderately tannic finish. A promising barrel sample. Unti 2010 Montepulciano, Estate, Dry Creek Valley. Aged in 30% new oak. Dark color, with earthy dark berry fruit, dried herb, and pepper aromas. Moderately bold on the palate, with big grippy tannins that sneaked up on the finish. Unti 2010 Sangiovese “Riserva,” Estate, Dry Creek Valley. From Sangiovese Grosso clone, aged in 40% new oak. Medium-dark color, displaying bright black cherry and spice aromas, with touches of earth and sweet oak in the background. Medium-bodied with great structure, this finished with big but fairly refined tannins. This shows plenty of promise but could use some time in the cellar. Comments: Mick Unti was behind the table at the tasting. The vineyard was first planted in 1990 and the Unti label was launched in 1997. Both have long been known for Rhône and Italian grape varieties, as well as Zinfandel. The Sangiovese Grosso clone that goes into the Sangiovese “Riserva” wine is used in Brunello di Montalcino. Wind Gap 2012 Trousseau Gris Fanucchi Wood Road Vineyard, Russian River Valley. Fermented in concrete egg and aged in stainless steel and neutral oak. Very light salmon color, this displayed stone fruit, earth, and lots of spice. Medium-light on the palate with some tannic bite on the finish. Wind Gap 2012 Arinto, Pierce Ranch, San Antonio Valley. Most of this wine went into kegs for restaurant by-the-glass programs. Very light straw color, with tangerine, herb, and faintly floral notes. Medium-light weight with a lively mouthfeel with a clean, refreshing finish, nice. Wind Gap 2011 Pinot Gris, Windsor Oaks Vineyard, Chalk Hill. Skin-fermented and left on the skins for about 70 days. Light color, showing stone fruit, melon, spice, and almond on the nose. Medium-bodied with a slightly minerally note in the mouth and mild tannins on the finish. Wind Gap 2011 Mourvèdre, Bedrock Vineyard, Sonoma Valley. Fermented in concrete by carbonic maceration. Medium color, with stem/herb notes upfront along with bright black cherry fruit, earth, and an orangepeel note. Fairly lively mouthfeel with medium-light tannins, this could use a bit more time in bottle for everything to integrate better but it’s developing nicely. Wind Gap 2006 Nebbiolo, Glenrose / Luna Matta Vineyards, Paso Robles. Medium-light garnet color, this had cherry, earth, and baking spice aromas with mildly smoky and floral undertones. Medium-light weight on the palate but with a grippy tannic finish. A wine that still needs time to reach its potential. Wind Gap 2009 Blaufrankisch, Ritchie Creek Vineyard, Spring Mountain. Dark purple color, with earthy dark berry fruit and spice on the nose. Medium-full bodied with chewy tannins. Comments: Wind Gap, founded in 2006, is the label of Pax and Pam Mahle – both were on hand to pour their wines. The winery has recently moved into The Barlow, a complex of new and renovated buildings on the eastern edge of downtown Sebastopol.